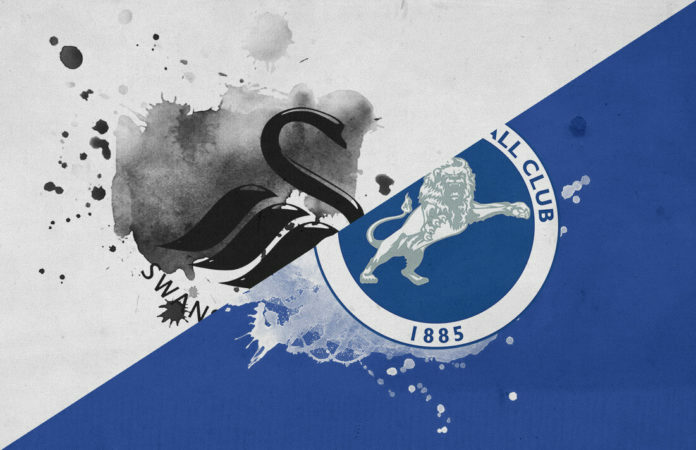 After their unbeaten start to 2019 came to an end last weekend at Bristol City, Graham Potter’s Swansea City got back on track on Saturday with a narrow 1-0 home victory over Millwall. 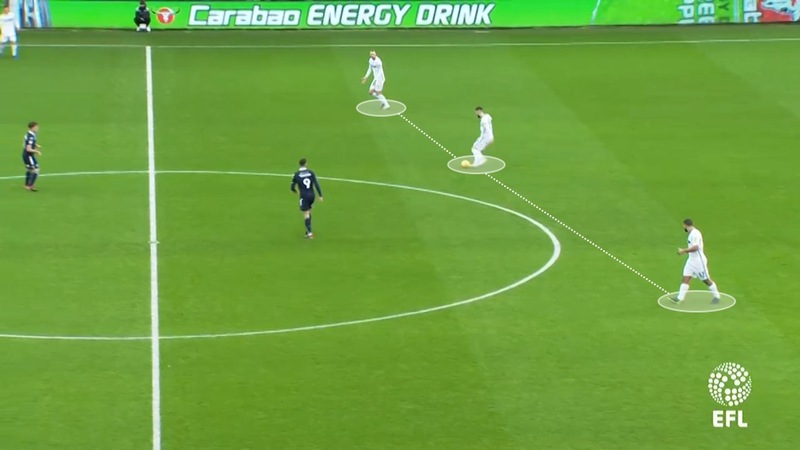 In this tactical analysis of the EFL Championship encounter, we’ll take a detailed look at how Swansea were able to eke out the win and manage some pressure in the second half as the visitors looked for an equaliser following George Byers’ opener just two minutes before half-time. Having missed winger Dan James for the trip to Bristol City after a failed move to Leeds United, Swansea manager Graham Potter welcomed him back to the starting line-up. Oli McBurnie was benched due to illness and Wayne Routledge returned following an injury. Millwall manager Neil Harris named an unchanged side from the one that drew 0-0 at home against Rotherham United the weekend before. 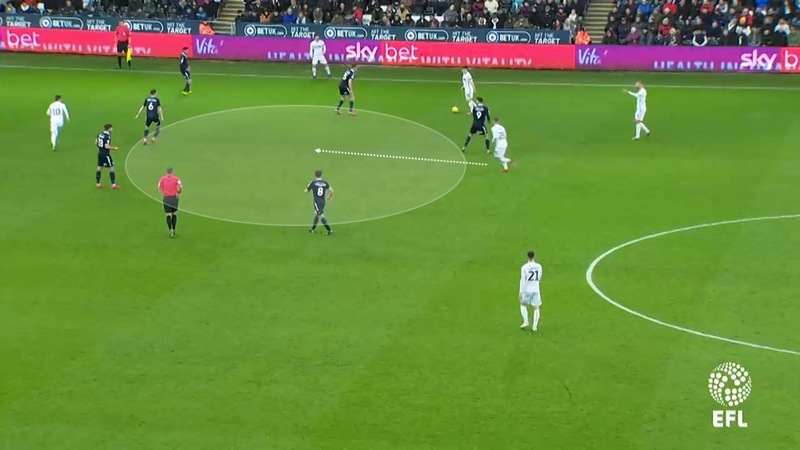 Swansea City were identified above as playing in a 4-2-3-1 formation but given their flexible rotations, it could also have been regarded as a 4-3-3 with the midfield trio of Matt Grimes, George Byers and Bersant Celina all playing different roles. Grimes was the deepest of the three and as we’ve seen in previous games in recent weeks, he dropped in between the two centre-backs to start attacking moves from deep positions. 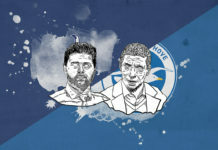 As we saw in the incredible 3-3 draw at home against Birmingham City, Swansea City were heavily reliant on their right side to get into attacking positions in the final third. The other comparison from that game was Millwall’s pressing approach. 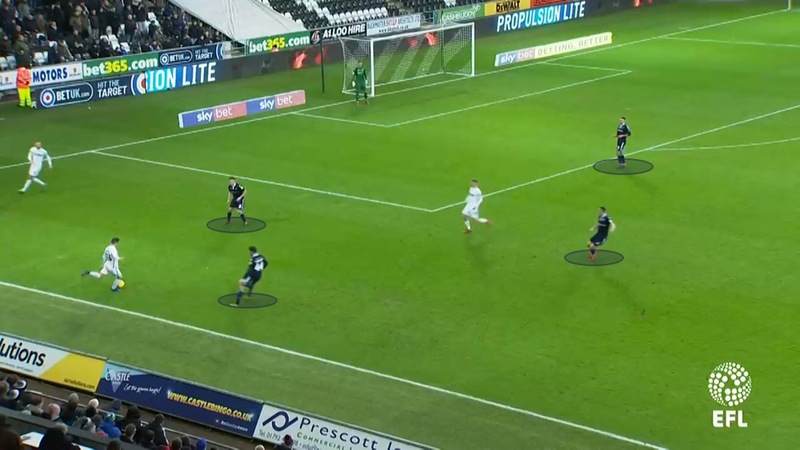 They opted, like Garry Monk’s Birmingham did, to sit deeper in a tight defensive block, inviting the home side into their own half where they would then look to regain possession and quickly release runners through the channels as the below image shows. 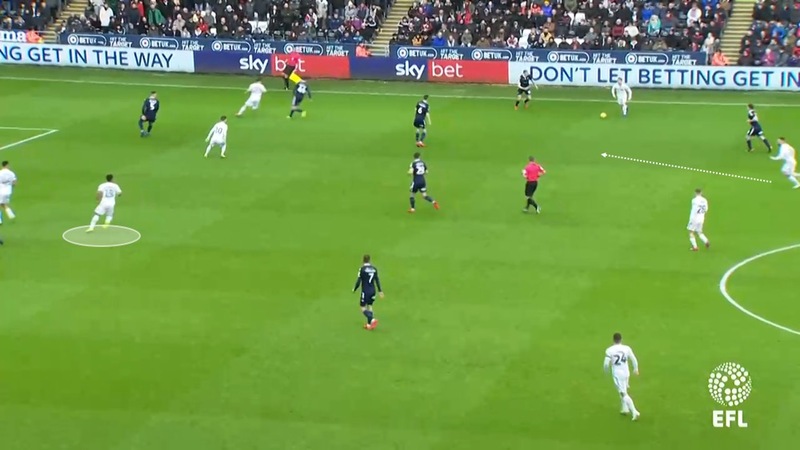 As soon as Millwall regain possession, they have two players running forward looking to counter and expose Swansea who committed players forward. 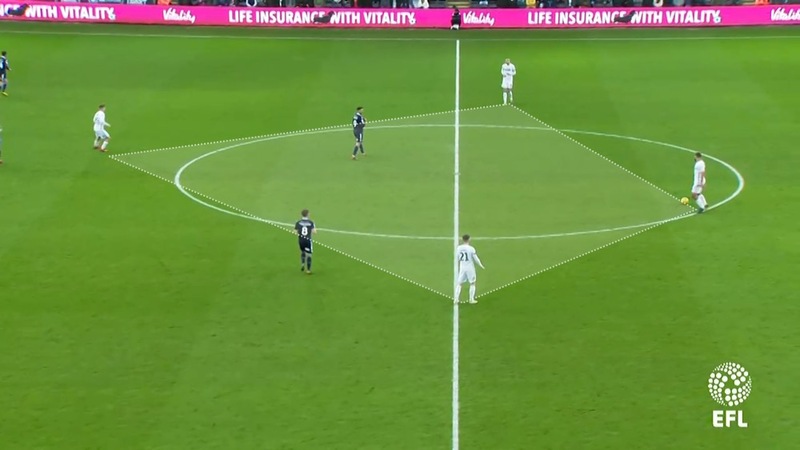 With Swansea City committing their full-backs forward, Millwall look to play quick and direct passes into the wide areas where there is space in behind. 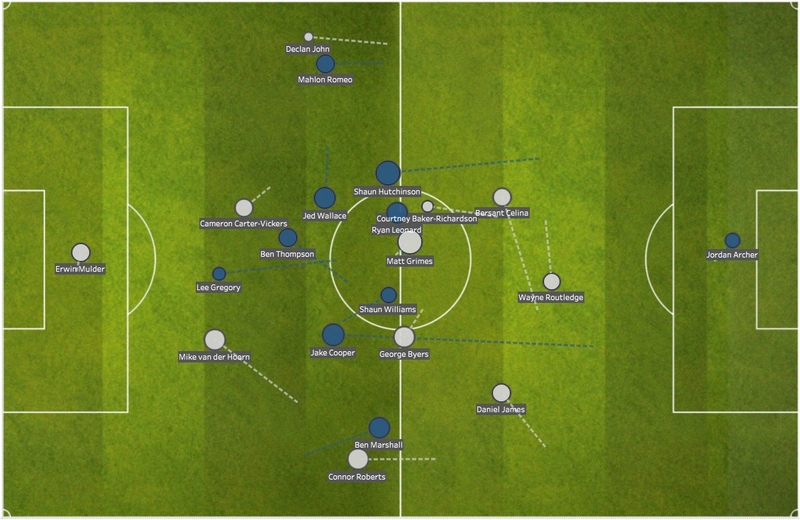 The image below shows how Swansea were typically vulnerable to counter-attacks if they did lose possession in duels. Millwall have two players in plenty of space just inside Swansea’s half. You can also see full-back Connor Roberts running back to get into a covering position. Swansea City dominated the first half with 73% possession and 325 attempted passes (90% success rate). In comparison, Millwall attempted 119 passes with only 79 of them successful (66%). Despite their dominance, Swansea were only able to create three first-half chances. 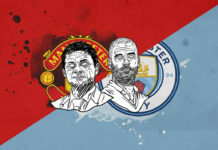 The first came inside the first three minutes with left-back Declan John sending in a cross which came back into the path of George Byers whose shot was parried away by the goalkeeper. Former Ajax defender Mike van der Hoorn had the host’s best chance, heading over from a corner after 27 minutes. Despite their predictability of looking to the right side to get forward and to get the speedy Dan James in behind, they weren’t able to create any clear openings from that side. You can see why in the screenshot below. 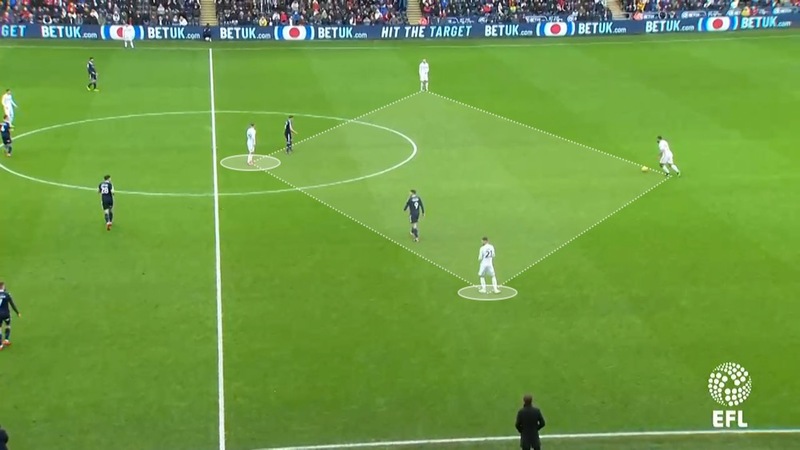 Recognising Swansea’s strength in this area, as Birmingham did, Millwall congested their left-back area of the pitch, ensuring that the likes of James, Roberts and Celina had little to no space to work with. They were only able to get Dan James in behind once down the right in the first half thanks to a quick give-and-go as Celina played a ball down the wing for the winger to chase. 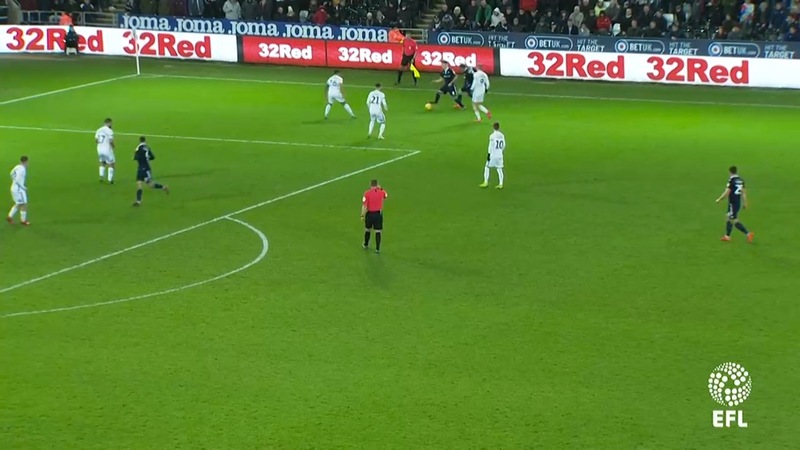 Swansea full-back Connor Roberts had Dan James, Bersant Celina and George Byers in close support of him down the right but on the opposite side, Declan John lacked support in front of him. Wayne Routledge was continuously moving into a central position in the first half, leaving left-back Declan John without any attacking support in front of him. Matt Grimes moves forward into space here to create a useful pivot and help link up the play down that right side. Swansea left-back Declan John has nobody to link up with here as Routledge moves out from a central position. The average touch map for the first half is shown below. You can see how difficult it was for Declan John to involve himself in the game in the first half due to Routledge’s tendency to move inside to support striker Courtney Baker-Richardson. First-half average touch map. Routledge moved inside from the left and Swansea City lacked attacking balance across the pitch for the majority of the first half. (Swansea attacking left to right). 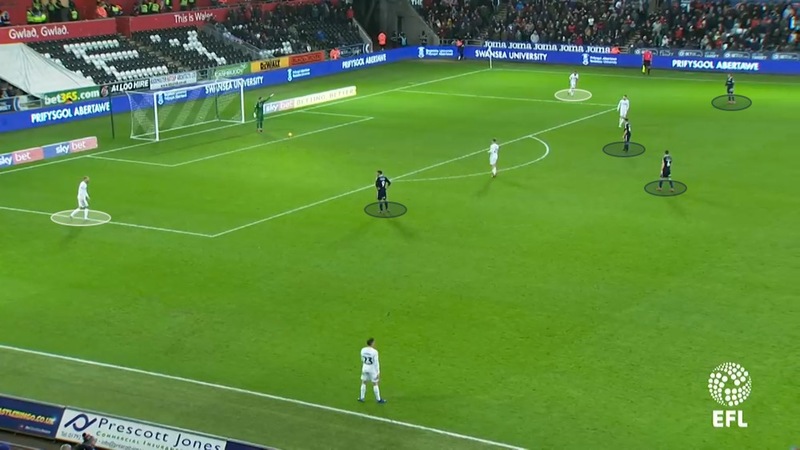 To create better balance across the pitch and to offer an attacking outlet on both sides, Swansea manager Graham Potter made some adjustments during the first half. Matt Grimes started to move to the left side of what was effectively a back three in the first phase. This created a diamond with George Byers at the top and captain Mike van der Hoorn on the right side. The Dutch defender has been a useful player to bring the ball out from the back and make progressive, vertical passes through the lines. With Matt Grimes on the left side of this diamond, Swansea now had options to make these forward passes on either side of the pitch. The above screenshot shows another example of Swansea’s deep-lying diamond. George Byers’ movement throughout the game was excellent and he always well positioned to receive a pass and create good passing angles to help link up the play going forward. Millwall block a passing route to George Byers at the top of the diamond. Both George Byers and Matt Grimes (circled) are looking to see their team-mates’ positions as they await a pass from a defender. Millwall’s front two are well positioned to press whoever receives the ball on either side of Swansea’s deep diamond but they’re outnumbered against four. George Byers dictated the game for Swansea in the middle of the pitch and Millwall started to cover off passing lanes to the youngster. 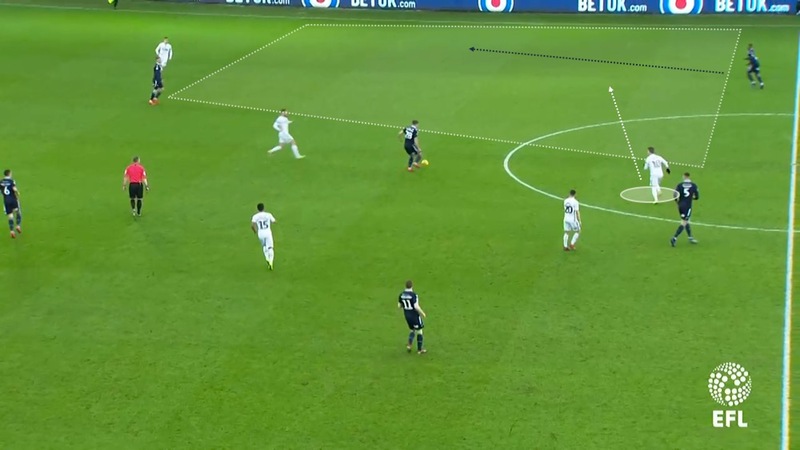 In an effort to help break through a congested right flank, Swansea’s attacking players on that side were always looking to drop back into space to create passing options and angles forward. Below, Dan James drops deep to offer a passing option for defender Mike van der Hoorn as Millwall have closed off the other passing lanes to Celina, Roberts and Byers. Moments later there’s a similar situation. 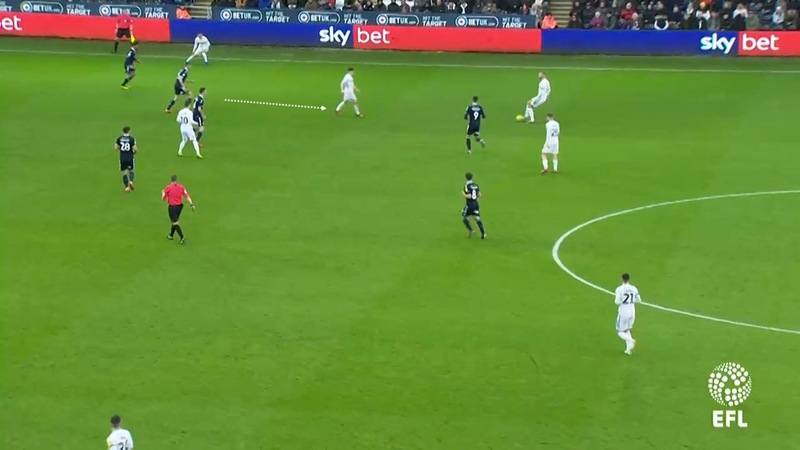 To help and to encourage the team to look to move forward rather than recycling possession backwards, however, George Byers moves forward into space, James makes the pass and Swansea’s attacking move can continue. Other than looking for counter-attacking opportunities and releasing runners through the channels, Millwall were happy to go long and direct from deep positions. A Millwall defender aims a long diagonal as the visiting side look to go long and direct. As well as moving Matt Grimes to the left side of an effective back three, Potter also swapped Wayne Routledge and Courtney Baker-Richardson. Routledge was now playing through the middle, as he already was, with Baker-Richardson moving across to the left. 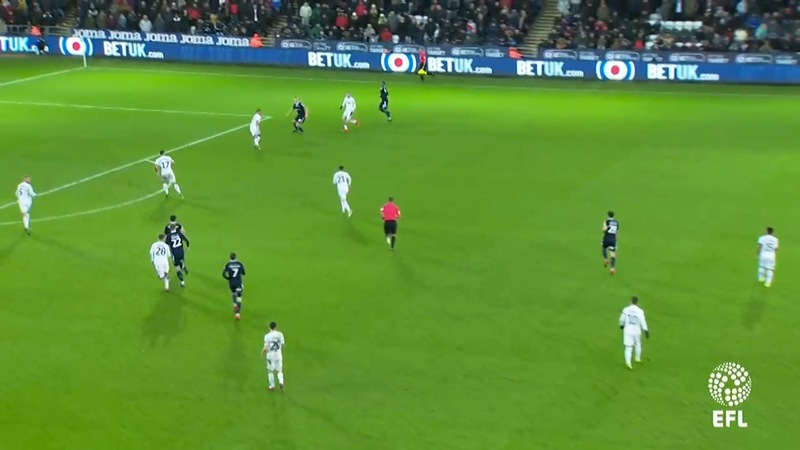 To help encourage a better dynamic down the left, Bersant Celina moved over to that side and within seconds Swansea were able to get into the final third via the left side of the pitch. You can see Celina, circled below, making a run through the inside channel as left back Declan John finally has someone to work with in the final third. This move saw Swansea’s shape now more recognisable as a 4-3-3. Swansea City saw more action down their left side inside the opponent’s half. Swansea’s all-important winning goal came from a Matt Grimes’ in-swinging corner from the right. After seeing his first shot blocked by a defender, Byers was able to pick the ball up again, move to space on his left side before firing a shot into the net with the help of a slight deflection on its way past the goalkeeper. After conceding a goal just a couple of minutes before the break, this encouraged Millwall manager Neil Harris to change his side’s approach in the second half in an effort to get back on level terms. 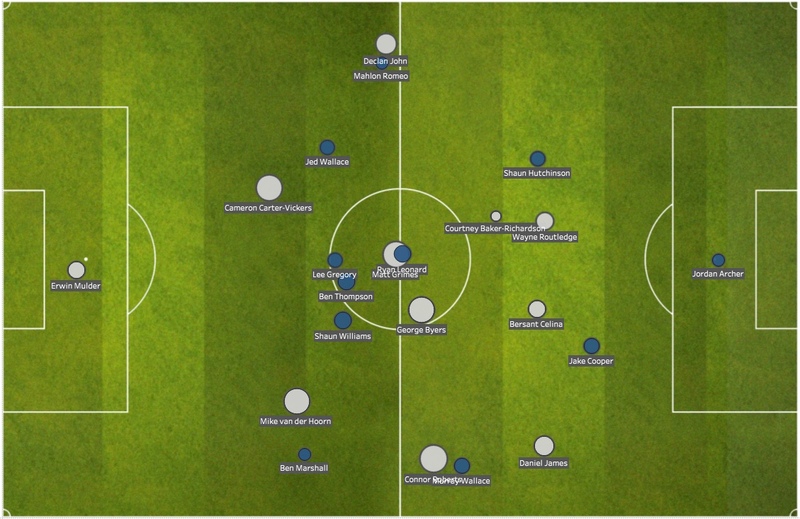 The average touches map below shows the average positions in the second half. The dotted line for each player shows a comparison to their first-half average position. 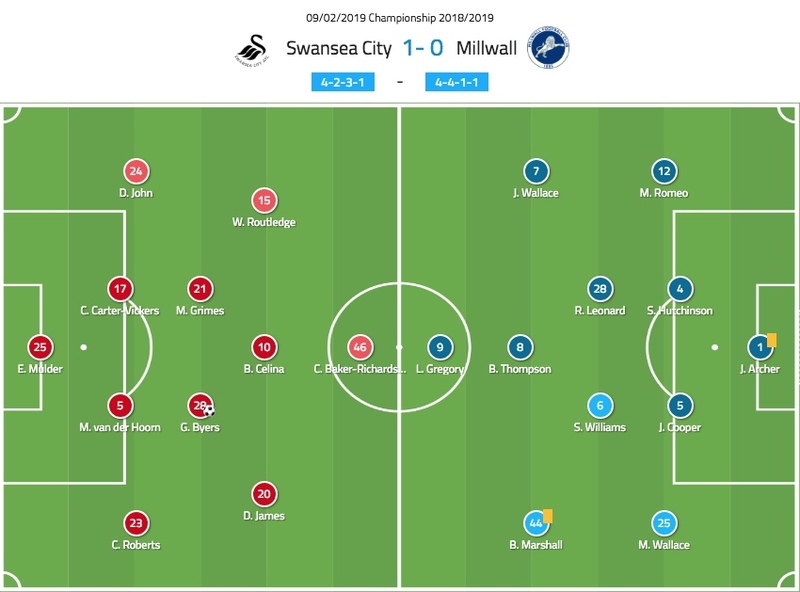 In particular, Millwall’s centre-backs have pushed right up into Swansea’s half whilst Swansea’s entire back four have retreated back into their own half. Second half average touches map. Millwall (blue) attacking right to left. After Swansea dominated the first half with 73% possession and 90% passing accuracy, the second half was a far more balanced affair with the hosts only edging possession with 51% and accurate passes (196 – 172). 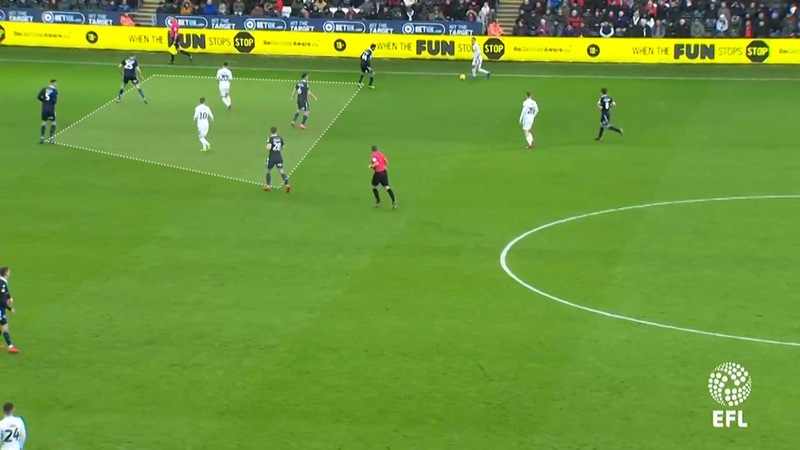 Having allowed Swansea City to bring the ball out of the defence and welcoming defenders into their own half, Millwall now adopted a high press, looking to disrupt Swansea’s deep passing patterns. Connor Roberts is forced long in the example below and there were many occasions when the hosts had to play quick long balls to avoid losing possession in vulnerable positions. 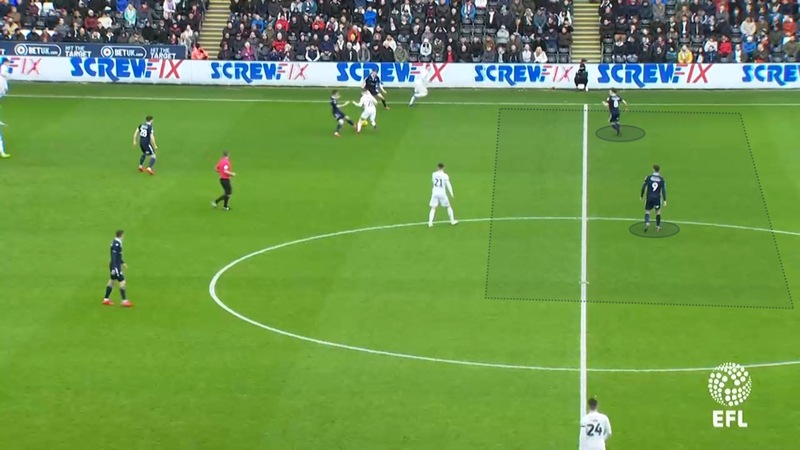 Having said that, Swansea City stuck to their guns and still looked to play out from the back, bypass the high press and look to take advantage of the extra space further up the pitch. Against the high press, Swansea now split their two centre-backs very wide with both Matt Grimes and George Byers dropping deep in the middle. This helped to spread Millwall’s high press across the pitch, providing more space to pass through the lines. 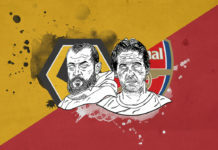 They were only successful in breaking through the press on a few occasions as Swansea had to be wary of their defensive vulnerability on their left side. Their narrow shape later in the second half meant that Millwall made full use of their right-back, with plenty of open space down that side to attack into. Crosses from this area were often poor though, so it wasn’t as much of a threat as it should have been. Swansea’s Bersant Celina has to move across as Millwall’s right-back has plenty of space to attack into down their right. As you can see in the screenshots above and below, Millwall’s right back was often available in plenty of space down the right. Below, striker Courtney Baker-Richardson, who had swapped positions with Wayne Routledge by moving to the left of a front three, was often encouraged by his manager on the sidelines to drop back and offer defensive cover. To fix this left side vulnerability, Swansea City manager made a change on 70 minutes, replacing Baker-Richardson with Oli McBurnie. The Scot was clearly encouraged to drop deeper to close the space over on that far side. Swansea left-back Declan John was also not as committed in attack down the left compared to the first half as he held a deeper position (below). As Swansea closed off Millwall’s attacking outlet down the right, the visitors, still chasing a 1-0 deficit, later went more direct. They aimed long diagonals and looked to win the aerial balls and aim for central runners moving forward into the penalty area. Millwall missed a glorious chance to salvage a point late on as Jake Cooper failed to convert from just a yard out following a header aimed goalwards from a right-sided cross.